It's no secret that today's retail landscape is more competitive than ever. Not only are you competing with the store across town, but now, through online shopping, you must compete with stores all over the globe. Still, when asked their preference, many customers prefer to shop in a brick and mortar store, as long as they can have a positive experience that they feel is worthwhile. Making the retail experience great holds the key to attracting more customers, and five main areas of your store’s operations directly impact the customer's experience in your establishment. Focusing on these five areas can help you manage and grow your business. Maybe 20 years back, everyone used to say that customer service was the most important element. Today, it's no longer just about service, however; it’s about the overall customer experience in your store. A quality, memorable experience happens when all aspects of your retail store work well together, from salespeople to policies to cleanliness to efficient and attractive merchandising. Drive more business in your store by focusing on the overall experience for customers. You can start with these 4 Strategies to WOW Your Customers. It helps if you can walk into your store with the eyes and mindset of a customer, and go through every step of their experience, looking for any glitches in the flow. Find out How to Secret Shop Your Store or have a friend unknown to your staff go on a secret-shopping mission for you. One of the biggest influences on customer experience is your inventory management. Being out of stock on hot items, or displaying your stock of items with no organization, rhyme or reason can make shopping feel like a chaotic experience and drive customers crazy. Additionally, since cash is king in retail, your ability to manage your inventory well and turn it over quickly is paramount to your retail store not only growing, but staying alive and healthy for the long haul. If you have questions about managing your inventory, start by getting familiar with the concept of Inventory Turnover. The silent salesperson in your store is your visual merchandising. An engaging, well-done display can sell as many products as a live salesperson in your store. Each morning, as you unlock the door, stand on the threshold of your store like a customer would and take a thorough inventory of what you see. Would you like to shop here? Read The 5 Most Important Elements of Visual Merchandising to help hone your skills so that you can present your merchandise in a way that helps customers locate complementary items, such as color-coordinated outfits and accessories. In retail, everything speaks. Your store design, your employees’ dress and behavior, and your store policies all tell the customer what you truly believe. For example, if you go into a retail store and have a hard time differentiating between the employees of the store and the customers, no matter what the sign on the door says, this store does not put customers first. If you examine closely, you may find many practices and policies in your store that are working against your customer experience. Customer Service - What is It Anyway? And finally, the obvious one, people. You can have the best strategy in the world and the most compelling vision, but it’s all for naught if you do not have the right people in place. Walt Disney once said, "you can dream, design, create, and build the most wonderful place in the world, but it requires people to make it a reality." You might feel that you can just hire new employees with minimal interviews and replace them if they don’t work out, but hiring and training new staff takes time and effort, which translates into lost sales. Find out about the The Hidden Cost of a Bad Employee. Managing a retail store is a complex juggling act. There are so many areas to address that it can be overwhelming. However, if you start with the customer experience, then all the other areas start to fall into place. In other words, if the customer's experience in your store is what drives all of your business decisions, you will see how quickly everything comes together. 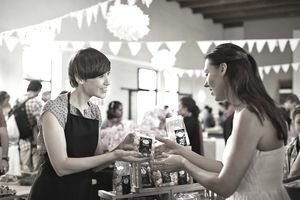 Store owners and managers that have a disconnect between the various focus areas have trouble when it comes to managing and growing their business. The compensation plans don't reward employees for the experience. The visual merchandising is clumsy and not inviting. The inventory is constantly out of stock or there are lots of empty spots on the store shelves. Try to stop thinking like a store owner, and start thinking like a customer. This one simple idea will unlock all the rest.